Since 1976, De Pere Auto Center has provided its customers with excellent, full service auto repair in De Pere, WI. Auto repair in our shop is the best in the area, and our customer service is even better! We know that our team members are at the heart of our shop’s success. While the employees at De Pere Auto Center have various backgrounds and different years of experience, they are all dedicated to providing you with the best automotive and customer service in the industry. 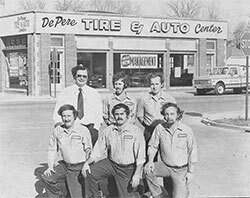 De Pere Auto when we first opened back in 1976.